Park Forest, IL–(ENEWSPF)– The Park Forest-Chicago Heights Board of Education met on Monday, February 19 to discuss various issues pertaining to the students in School District 163. Since February 19 was also President's Day, a federal holiday, however, board members discovered that they were not permitted to take any formal action. All items considered on will be voted on at a special meeting on Monday, February 25. Members stated that the district received 3.35 out of 4.00 for their financial review (equivalent to a “B”) and said that they were pleased with the results. Board President Virginia Ford reported that the schools have spent the last few weeks preparing for the ISAT test in hopes of meeting a “Y-P” for 2007. Ford and other board members discussed the topic of paying for band students' instruments and Board President Ford questioned whether the price of roughly $425 per student was worth supporting the band. Board member Kimberly Elmore-Perkins commented on the successful event recently held at Freedom Hall where students celebrated Black History Month. “They were excited and had worked very hard,” Perkins said about their effort to celebrate this cultural event. 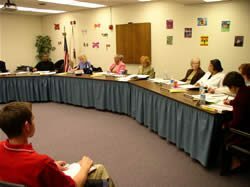 The Board held a special session, passing the resolution for abatement of the working cash fund, meaning that they would use some of their $2.5 million to try and keep the school buildings maintained well, and a resolution for the sale of general obligation limited tax (4%) working cash fund bonds, rated “A-”, in the amount of $3,000,000. In addition, the Board passed a motion to direct Superintendent Carmine to allow students involved in after school activities to ride the bus home and a motion to increase the hourly rate of pay for substitute teachers to $11.00 per hour. Unfortunately, due to the circumstance that the meeting was held on a federal holiday, all the special session resolutions and motions were voided. Even though school was in session on Monday, Superintendent Carmine was informed by a phone during the course of the meeting that the items would have to be voted on again. The call came from the school district's attorney Anthony Scariano. Members expressed opinions that the resolutions would be passed again by the end of the month, and seemed to take the news that they would have to meet again in stride. Hot topics of the discussion included the playground at Beacon Hill School and the school year schedule for elementary students. After talking about the potential risks and liability of the school district caused by the sliding fence at Beacon Hill School, members agreed that children at Beacon Hill should have access to their playground, in a similar way that students at other nearby school have access to their school playgrounds after school gets out. Members talked about the spring break schedule and the celebration of President’s Day for elementary schools in the following years. Perkins said that the elementary schools’ spring break should be aligned with the high schools’ spring break for family vacations, the celebration of Easter and for convenience for families and their schedules if they have children in middle school and in high school. A final decision was not reached regarding which day will be taken off to celebrate Lincoln’s birthday and President’s Day, but the Board needs to attain a waiver it decides to celebrate this holiday on Lincoln’s birthday or Presidents’ Day.